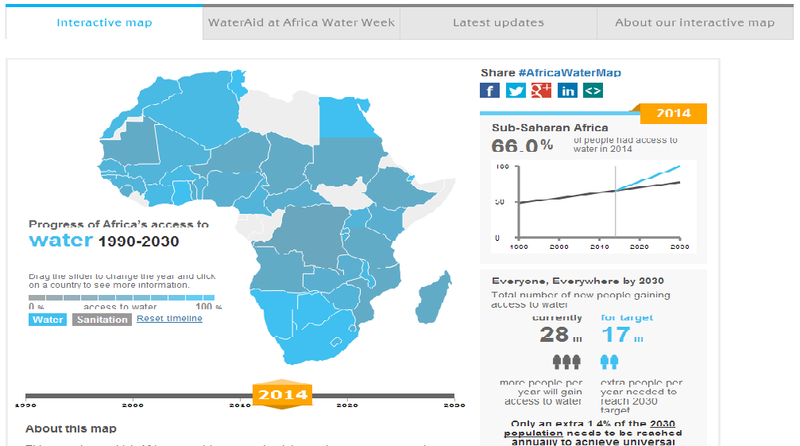 Home » climate change » development » featured » interactive map » world » How close is the dream of abundant clean water in Africa? How close is the dream of abundant clean water in Africa? (APO)– A new interactive map, published by the international development charity WaterAid, has been launched online showing that 14 African governments are on course or within touching distance of reaching the historic mark of everyone in their countries having access to clean drinking water by 2030. The map has been released on the day that African water ministers and delegates arrive for the start of African Water Week conference in Dakar, Senegal for crucial talks as to whether they should back a proposed new global Sustainable Development Goal for universal access to water, sanitation and hygiene by the year 2030. WaterAid are lobbying minister and delegates at the conference for the outcome communiqué to include such a commitment. “This map shows that a new water, sanitation and hygiene Sustainable Development Goal that puts Africa on track to everyone having access to these essential services by 2030 is realistic and achievable. “Many African countries are already on course to achieve this historic milestone at current rates of progress, and most others can get there with relatively modest improvements in levels of access. The map is understood to be the first online interactive data representation project produced with a predominantly African audience in mind, which is increasingly online and social media savvy. According to the International Telecommunications Union, around 177 million African’s are now internet users(5), while over 50 million African’s have Facebook accounts(6). The African Water Map shows that on average, 28 million people are gaining access to water each year across Africa, but that if this increased by an extra 17 million people, that everyone everywhere across the continent would have access to clean water by 2030(7). Currently over a third of African’s, 325 million, lack access to clean drinking water, while over 70%, 643 million, go without basic sanitation(8). A lack of access to these services costs sub-Saharan Africa over $50 billion USD every year in health care costs and lost productivity(9), more than the continent receives in aid(10). Nearly half a million African’s (481,000) die every year because of diarrhoea diseases attributable to a lack of access to water, sanitation and hygiene(11). A lack of access to these essential services is also understood have a substantial impact on the prevalence and mortality associated with pneumonia, and under-nutrition on the continent. The UN has estimated that half the hospital beds in developing countries are filled with people suffering from diseases caused by poor water, sanitation and hygiene(12). WaterAid’s vision is of a world where everyone has access to safe water and sanitation. The international organisation works in 26 countries across Africa, Asia, Central America and the Pacific Region to transform lives by improving access to safe water, hygiene and sanitation in some of the world’s poorest communities. Since 1981, WaterAid has reached 19.2 million people with safe water and, since 2004, 15.1 million people with sanitation. • 748 million people are without safe water, or one in 10 in the world. • 2.5 billion people are without adequate sanitation, or 36% of the world’s population.